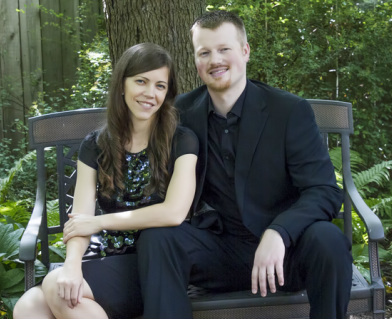 The Norell Piano Duo began performing together in 2009 at LCC International University in Klaipeda, Lithuania, and has continued to present repertoire for one and two pianos across North America. Recent engagements have included performing at the Music Archive of Sarasota, Florida, the Ruthmere Fall Concert Series, and Ohio University. At Goshen College, Luke and Mary Rose have been included on the Rieth Chamber Series and also performed Tchaikovsky's Nutcracker Suite in Sauder Concert Hall for the Afternoon Sabbatical Series. They have competed in the Liszt 200 Chicago Competition for piano duos, performed at Northwestern University, and at Indiana University with the American Liszt Society. The Norells performed at Edvard Grieg’s home Troldhaugen in Bergen, Norway, as part of the workshop “Edvard Grieg and the Human Voice”, and have collaborated on multiple occasions with celebrated Norwegian bass-baritone Njål Sparbo in Goshen. As founding board members of the newly-formed nonprofit organization, the Edvard Grieg Society of the Great Lakes, the Norells organized its inaugural conference at Goshen College: “SalzBergen: Exploring the Intersection between Wolfgang Amadeus Mozart and Edvard Grieg.” The conference included guest artists from Norway and across the USA, and will be followed by an upcoming symposium in Indianapolis in 2019. Their collaboration as teachers and adjudicators recently included adjudicating and helping to create the Robert Beardsley Piano Prize at the Ruthmere home in Elkhart (IN), appearing as guest artists for the Ohio Music Teachers Association Summit County Duet Festival, judging for the Kelowna Kiwanis Music Festival in British Columbia, and teaching as faculty at the University of Northwestern Piano Institute in St. Paul, MN. Luke and Mary Rose have worked with the Ravinia outreach program Reach*Teach*Play in bringing classical music to children in inner-city Chicago schools, performing selections from Camille Saint-Saëns' The Carnival of the Animals and Gustav Holst's The Planets. They both teach on the faculty of the Goshen College Community School of the Arts.